What do you think of when you think of spring? You know spring is near when the days lengthen and the temperature begins to warm. You may think of the robin as the first sign of spring. But if you have a taste for maple syrup, you may think of collecting sap from a sugar maple tree. Sugar maple trees produce sap during the summer, which gets stored through the winter in their roots. When spring is near, the sap begins to move from the roots up the trunk and stem. This provides food so the trees can grow their leaves. It takes about four to six weeks for the leaves to emerge from the buds. During these weeks, sap can be collected and transformed into a delectable treat - maple sugar. How much sap do you need? Sap starts with a sugar content between 1 percent and 4 percent. The percentage of sugar content tells us approximately how many gallons of sap it will take to make a gallon of syrup. For example, if the sap is 1 percent sugar, we would need 86 gallons of sap for one gallon of syrup. If the sugar content is 3 percent, we would only need 28.6 gallons of sap. The yield of sap varies from tree to tree, and is also dependent on weather. On average, the sap collected from one tree will make one quart of syrup. Who taught us how to make maple syrup? Native Americans taught the European settlers how to make maple syrup. They would cut a gash in the tree and collect the sap in containers made of tree bark. All the sap collected was poured into a trough, where they would drop hot stones into it to boil off the excess water. The thick fluid that was left in the trough was the syrup. We still use the same basic principles to make maple syrup. Here at the College of Environmental Science and Forestry's Heiberg Forest, we tap the sugar maple trees by boring a small hole in the trunk and inserting a small tube called a spile. When inserted properly, the spile does not harm the tree. 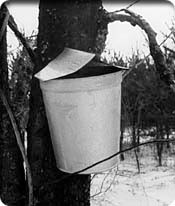 In the early days of sap gathering, people hung pails under the spiles and let the sap drip into them. It was hard work to collect and consolidate the sap from the pails because they were heavy. They also leaked and wasted valuable sap. In addition, the pails were difficult to keep clean and free of insects. Today, sap collection is easier and cleaner. We run a network of tubing between trees that allows the sap to flow by gravity into a central collecting tank. Once the collecting tanks get full, we transfer the sap to a tank truck so we can transport it to the sugar house. The sugar house is where we turn the sap into maple syrup by evaporating the excess water. The sugar house was specially constructed for the evaporation process. The roof has large doors so the steam can escape, and the woodshed is attached to store all the firewood we need. We burn about one cord of wood for every 15 gallons of syrup we make. The sap flows through the evaporator at the same rate that water is boiled out. The lower the sugar content of the sap, the longer it takes for the evaporation process. The sap is transformed to syrup when the sugar content reaches 66 percent. Prepared by Sarah L. Vonhof, Candidate for PhD, Department of Forestry, SUNY-ESF.